Riverside Drive Waterfront overlooking the magnificent Choptank River. This fabulous property features 4BR 3.5BA main home plus 2BR 2BA Guest House. Spectacular location with high elevation, outside of the flood plain, enjoys spectacular 10 mile unobstructed views along with sunsets. 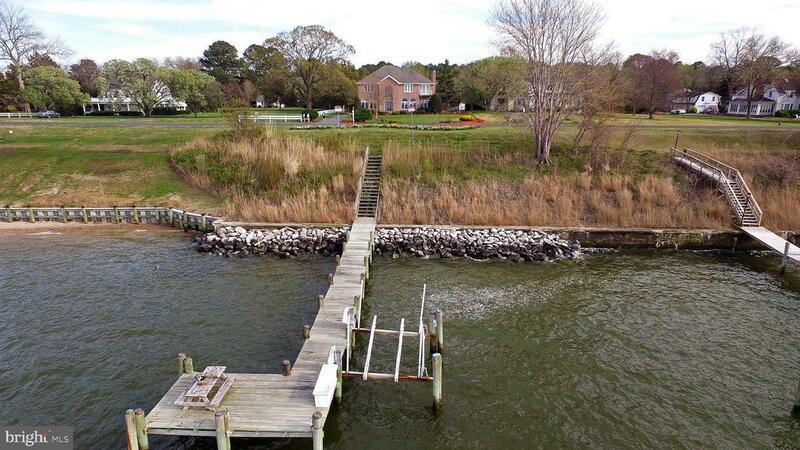 Protected shoreline, pier and lift to enjoy all the boating/fishing opportunities of the Choptank River & Chesapeake Bay. A short boat ride to Oxford, Tilghman, the Bay, or Cambridge Creek make this an ideal location. The open floor plan of this almost 5000 Square Foot home make for ideal entertaining or casual living. Generous room sizes and water views from virtually every room. This home on the Iron Man/Eagle Man triathlon home stretch is one of the finest locations in Dorchester County. Directions: High Street to Water Street to Hambrooks Blvd past Pink's Pond to Bellevue. Follow to stop sign. Turn right onto Oak Street and follow to Riverside Drive. House on left - owns both sides of road including waterfront and pier. Inclusions: 2 BR 2BA Guest Cottage with all appliances. 55" TV in Main House.